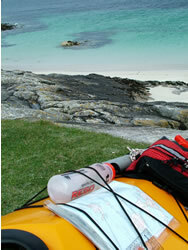 The sea kayaking around the Outer Hebrides is some of the best in the world. The trips are too numerous to be mentioned here but to give you an example: Just paddle out from Stornoway into the Minch and the sea cliffs are teeming with birds and with seals swimming about. You don't even need to leave the harbour as they wait from the cast-offs from the fishing fleet. With literally hundreds of islands, sea stacks caves and miles of stunning coast line it makes for spectacular paddling. A good read about sea kayaking around the North of Scotland and the Hebrides is Brian Wilson's book Blazing Paddles: Scottish Coastal Odyssey published by Wildland Press in paper back. It is worth mentioning sea kayaking is not the only paddling done in the Islands. The surf kayaking is difficult to rival with beach breaks and reef breaks, which the board surfing fraternity are only just beginning to discover. So you will need to bring all you boats. Visit the surf page for details. 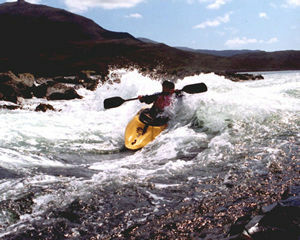 If you need more general information on kayaking in Scotland go to the Scottish Canoe Association. They will be able to supply you with information on current access issues and all the whys and wherefores of paddling in Scotland. They are very friendly and well informed. For paddling in general in the Great Britain visit the British Canoe Union. If you want information on the weather the Met Office have a good page with in the inshore forecast. If you are intending to paddle around the islands the weather is very changeable and the local coastguard (Stornoway)are another useful source of help and information. You should inform them if you are doing a trip and then don't forget to call them when you get back. They can be called either using channel 16 or +44 (1851) 702 013. 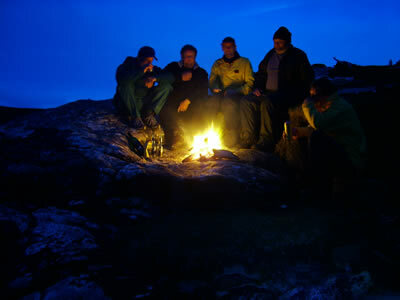 A good dinner settling with it's warm after-glow and the prospect of a dram of good whisky. Paddling in the Outer Hebrides !